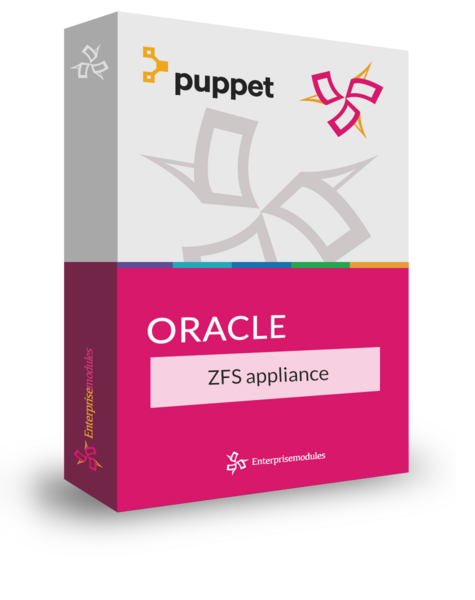 The ZFS appliance puppet module allows you to manage Oracle ZFS appliances. You can create and manage projects and shares. Check [here] for information about the Oracle ZFS storage appliances. Contact us to get pricing information or to get a subscription for this product. Here is an example on how to manage a ZFS project on a ZFS appliance. Check here to see the full documentation for this module. Are allowed to use the latest and greatest version without any extra charge. We will make sure the modules keep working with the latest versions of Puppet en the supporting products like Oracle IBM MQ or WebLogic. Our basic licensing model requires a subscription per node. The subscription is valid for a year. To make this work, we need you to send us the node name of the system you want to use the module on. (Not the puppetmaster, but the system where the agent is running.). Based on this information we will send you a file containing the entitlement for your node(s). You can purchase the entitlement in the shop or you can contact us. After you have ordered this module, you will receive an entitlement file. This file contains the information needed to run the software on your Puppet machine (agents). When you want to use Pay per use, purchase a single Pay per use license in the store. You can then download the entitlement file on your systems and use ALL of our puppet modules like this. There are no related blog posts yet.